Maxwell Light Lister is a lights manager for 3ds Max in which you can change most of the significant parameters for the lights of the scene. 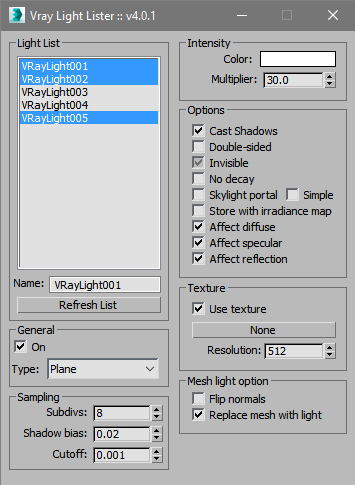 The original creator, Eric Mehl, developed a script that allows the possibility of listing 3ds Max native lights and also lights from Maxwell Render. Christmas lights generator is a plugin for 3ds Max. It creates a string of lights that go around a cylindrical object or a given spline. At this moment it only works for cylindrical Objects with the property "radius" and splines. You have to download the types of bulbs and cables. Verify the route of your files. 1) Select a cylindrical object. 2) You can choose where it will start and end. By default covers 100% of the object. 3) Select the type of bulb you want. 4) Choose the number of bulbs. Simple script for randomizing selected lights intensity temperature and delete percentage of lights. Hi, this script turns lights in selection ON or OFF. You can make a quick selection regardless of object classes. Creates complex light animations which would be laborious to do by hand. Lightning - flickering lights - fluorescent lights turning on - strobe lights - pulses of light. This does it all. - VRayLight, VRaySun, VRayIES and VRayAmbientLight(SP4a). Creates a VRay Light Select Element for each light in your scene. Elements are named with prefix of the nameTag variable. You can change this variable if necessary for your pipeline. To do so you will need to open the script and modify the variable within the struct.